If you are ready to bring your blogging efforts into the "video era", then this letter was written just for you…Read on to get your hands on this never before revealed information! * Which individuals started out video blogging only to end up famous. * The steps needed to have your own video blog up and running in no time flat without any technical experience. * How to get your first video made and ready to post to your new video blog in virtually no time. * The best way to create video content that will make your video blog popular with surfers and subscribers. * Different ways to take video and edit the video to be placed on your new video blog. * The best ways to get high quality equipment for deeply discounted prices. 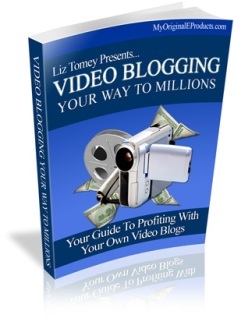 * How to use video blogging to establish or increase affiliate sales and sign ups. * How to use video blogs to create a higher click through rate on ad campaigns. * Ways to get others to pay you for creating your video posts. * How to use video blogs to create entirely new streams of income.